I've reviewed one of Nashville's Korean restaurants, Korea House, but have been wanting to try the other for a while. 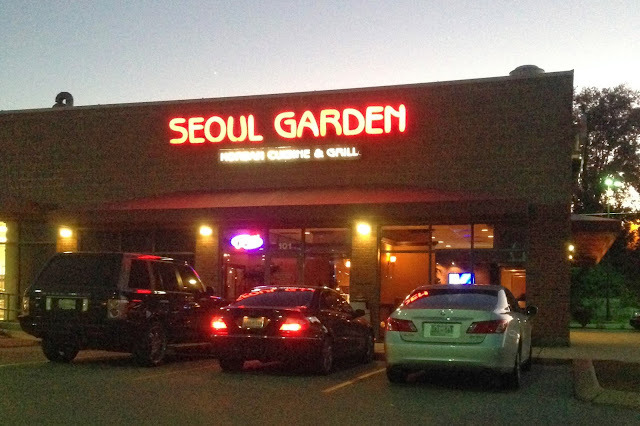 Seoul Garden is actually closer to where I live than Korea House, but both restaurants are very different! Since people always ask me about local Korean restaurants, I felt I needed to experience both to offer a solid reco. I was fortunate to be joined by the beautiful foodies Lauren and Lauren for dinner, of Lladybird and Old Red Boots respectively. I liked that Seoul Garden had the cooktop tables I'm used to seeing in Korean restaurants that serve BBQ. There is a two-order minimum on BBQ to sit there, but we knew we wanted MEAT! 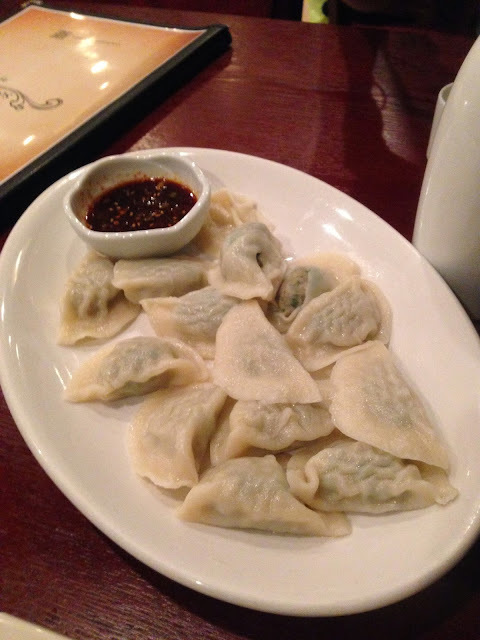 We started with some steamed mandu dumplings, and they served the requisite banchan small plates. For our BBQ, we ordered my favorite kalbi beef ribs, as well as spicy pork dwaeji gogi. I felt like they were a bit stingy on the kalbi, but they provided an ample plate of the pork. There was even enough for leftovers. Both were tasty, but I'm all about Korean BBQ beef, so if I came back I might ask for double if I'm sharing. We also ordered bibimbap, the dolsot version in the stone pot. My sister and Mom don't like the stone pot version as much, but Lauren loved how the rice got crispy where it touched the pot. I agree that it made it even yummier! We enjoyed cooking our meat at the table, and everything tasted great. The service wasn't that great once our meat was cooked, but there was a decent crowd for a weeknight. The best part about Korean food is that it is shared. We ordered three entrees, but we all ate bits and pieces of everything. Overall, I'd say that I like both of Nashville's Korean restaurants. Both are authentic, though not the same as what you'd experience in major Korean hubs like New York and L.A. There are things on the menu at Korea House that they don't have at Seoul Garden, and the price is a bit more reasonable. But for the cooktop experience, I do enjoy Seoul Garden's setup. They have more seating as well, and Korea House had a wait the last time we visited. I'd say that if you want laid back dining with a lot of selection (like casual dish dokbokki), choose Korea House. If you want BBQ cooked at your table with a hungry larger group, go Seoul Garden. I think my mother would approve of both (and already likes Korea House) but would choose KH for the prices any day. Everything about this looks heavenly! Next time you wanna eat Korean BBQ and want a copilot...I'm down! Kimmie, I am so down with that too! I think I'd like to go back to either!